Preparations in high gear for our Christmas concert…and Carnegie Hall! For 55 years, we’ve gotten off to a festive start with our highly-anticipated Christmas production in early December. 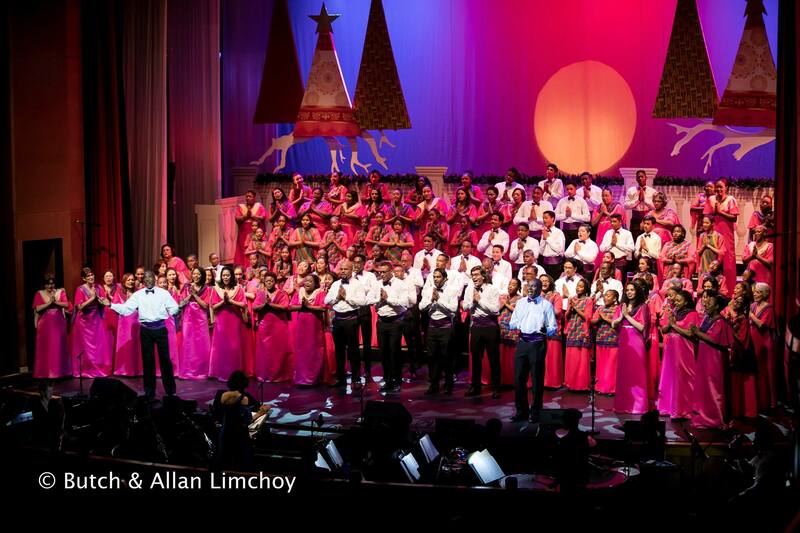 This year, for four nights only (December 6—9), the adult, youth and children’s choirs return to the Queen’s Hall stage with Someday at Christmas. Some of the most enthralling classic and contemporary holiday favourites, along with tributes to celebrated local music icons — Winston ‘Shadow’ Bailey and Ken ‘Professor’ Philmore — have been lovingly selected for this milestone production. Listed among them are the title piece “Someday at Christmas” performed by the young voices of the Youth Chorale and Children’s Choir, choral treatments of pop/rock anthems like “Bohemian Rhapsody”, excerpts from Rutter’s Mass of the Children and “Tonight” from West Side Story, in recognition of the centenary of Leonard Bernstein’s birth. Add to that parang and calypso pieces with choral arrangements by Desmond Waithe, all under the artistic direction of Gretta Taylor and Dr Roger Henry, and the concert series is a must-attend. Bringing our special touch to the performances will be soloists Hermina Charles and Jacqueline Johnson, along with up and coming lead singers from the Youth Chorale. Altogether, Someday at Christmas is set to deliver an uplifting and entertaining repertoire suitable for the entire family! As if our 55-year milestone is not already enough reason to smile, these days us Marionettes have yet another prospect to savour. The choir was recently invited to perform at New York City’s renowned Carnegie Hall in a massed choir production of Grammy-award winning composer Christopher Tin’s Calling All Dawns — under the baton of the composer himself. The invitation was extended after a producer viewed online Marionettes’ impressive rendition of “Baba Yetu” — a selection from the concert work and sung in Swahili. Not surprisingly, excitement is running high in the Marionettes camp as plans are in train to fund the upcoming tour via part proceeds from this year’s Christmas concert series. Marionettes still remains committed to its support of a range of local charities and causes across Trinidad and Tobago, having contributed close to one million dollars between July 2016 and July 2018. 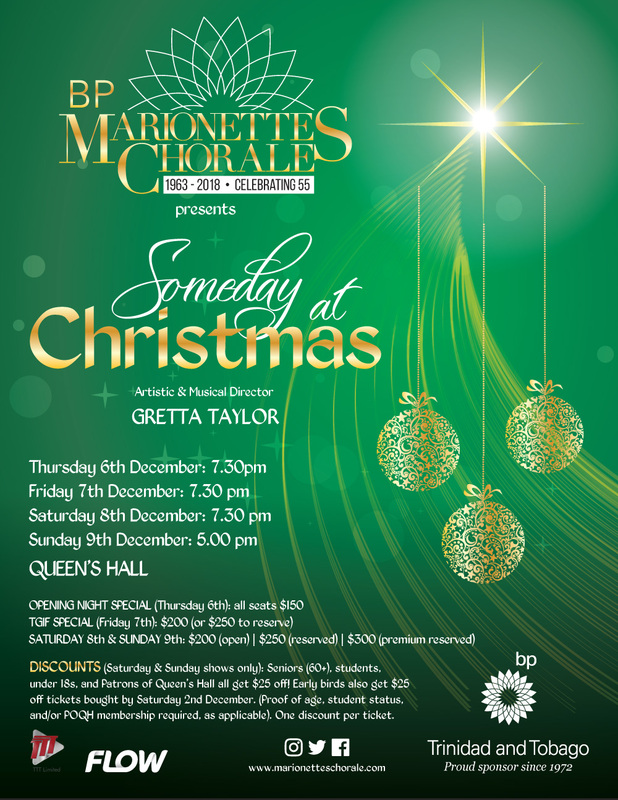 Proudly sponsored by BP, Flow, and TTT Ltd, Someday at Christmas proposes to deliver a programme that once again evokes the warmth of family and friends, holiday cheer and the music that keeps them coming back year after year. Tickets are available at the Queen’s Hall Box Office (624-1284, 10am–5:30pm from Monday 26th November) and from members. Pre-reserve your tickets today here (through Tuesday 4th ONLY). For the Friday, Saturday & Sunday shows, seniors (60+), students, under 18s, and Patrons of Queen’s Hall all get $25 off! Early birds also get $25 off tickets bought by Sat 1st December. (Proof of age, student status, and/or POQH membership required, as applicable. One eligible discount per ticket).